While calving jacks or calving aids seem like a simple tool, they are anything but simple to use properly. They require an experienced hand and a cool head when the stakes are at their highest. Even though the calving jack can cut out a lot of the pain and effort of the delivery process, don’t use it frivolously. It is very sore on the cow and calf, and it could affect future calvings if something goes wrong along the way. Clean and disinfect calving equipment before use. It is vital that you minimise contamination of calving equipment. A newborn calf’s immune system is virtually non-existent. 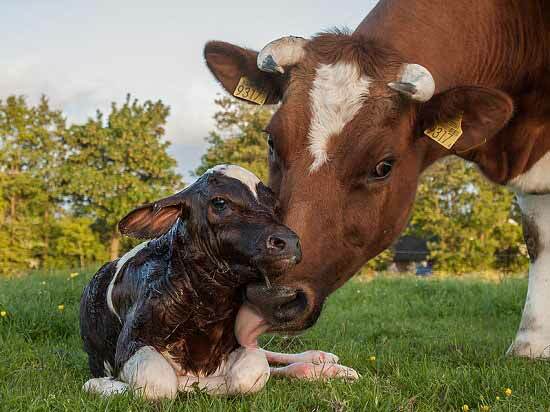 If the cow’s birth canal lacerates while pushing out the calf they are left vulnerable to infection. 3: Use a special calving lubricant, and plenty of it! An ounce of lubricant is worth a ton of pressure; however it must be the right kind. A household soap or washing up liquid is NOT suitable as this could irritate both the cow and calf. Lubricate the birth canal and the crown of the calf’s head. NEVER pull continuously at full strength. A mechanical calving aid can apply the force of up to six people. The jack should be used as a lever rather than to jack the calf out. Jack until you encounter pressure and then gently lever the jack by moving it down or sideways, depending on if the cow is lying or standing. Cranking blindly can be detrimental to the health of the cow and calf. Before calving begins, make sure you know how the calf should present and what to do if it’s emerging in a way it shouldn’t. An experienced farmer knows when to call the vet and go in from the side. 6: Place the ropes correctly. This is of vital importance to the health of the calf. Put one above the fetlock joint and a second loop below it for two points of pull. This will spread the pressure around. Additionally make sure there are no twists in the rope. These will cause leg damage. 7: Only use the properly designed ropes. Thin ropes could cause leg damage. 8: Keep reasonable and measured traction. Reasonable traction can be considered to be two adults pulling steadily on calving ropes with no jerking. While more than one person may assist, only one person should control the jack. Do not pull the cow backwards, if you are, ease off. Remember to pull when she pushes, and at a steady rate. Don’t try and pull the calf through if the cow isn't physically ready yet. Talk to your vet about the correct technique to prevent damage to both cow and calf. Because time is of the essence, tools like the Moocall Calving Sensor can be vital when you’re trying to judge whether you should use the jack. Bear in mind that this is NOT an exhaustive list and that there are any number of good practices that you can take to ensure a successful calving. If you have anything else to add, share it in the comments section below. I want to buy a calving jack set. Is that possible to ship it to Brazil? Appreciate your guidances re supplier or international distributors.